In its first year of existence, the Katahdin Woods and Waters National Monument drew nearly 30,000 visitors. Nearly half came in the summer, via the monument’s roads, and another 15,000 people visited the monument on snowmobiles during the winter. Considering that Gov. Paul LePage has forbidden the Maine Department of Transportation from installing signs directing people to the new monument, it is a great start. Counters at the monument’s three entrances counted 7,162 vehicles entering the parcel between May and mid-November this year. KWW Superintendent Tim Hudson conservatively estimated that each vehicle carried two people, for a total of 14,324 visitors. These visitors came from 45 states and nine countries, he said. Last winter, 15,000 snowmobilers used the monument, Hudson calculated, along with 500 skiers, bringing total visitation to nearly 30,000 over the last year. By contrast, the Allagash Wilderness Waterway, which was established in 1966, attracted 4,262 visitors last year, the highest number in several years, according to its annual report. Signs on Interstate 95 and other roads direct visitors to the state-run waterway. Tens of thousands of visitors are going to the monument despite the fact that no signs direct them there, that the U.S. Secretary of the Interior Ryan Zinke has left a cloud of uncertainty over its future and that plans for its development and use are still being crafted. In May, LePage directed Maine DOT to reject a request from the National Park Service to install signs directing visitors to the monument on the state’s highways. He cited the uncertainty created by a Trump administration review of dozens of monuments nationwide, including KWW. In April, President Donald Trump called for a review of 27 national monuments, many of which had been designated by former President Barack Obama. 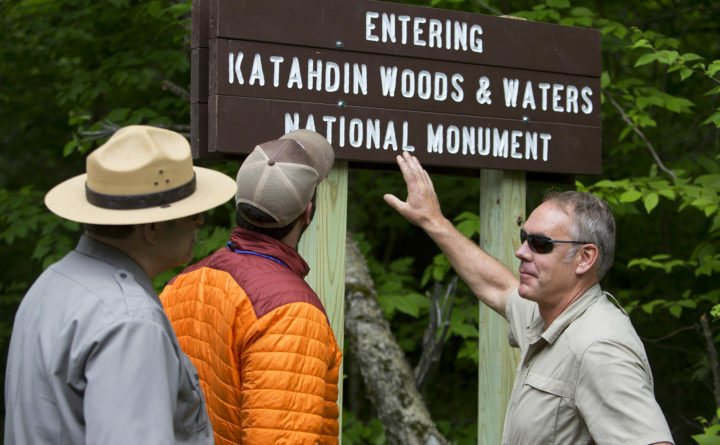 Zinke visited the Maine monument in May and said he may recommend that it become a national park. In draft recommendations to the president, however, Zinke called for “active timber management” within the monument, but he did not define what that meant. The memo also notes that “commercial timbering” is not typically allowed in National Park Service units other than to “conserve … historic objects. The memo does not explain how “active timber management” would be used to conserve historic objects in the Maine monument. Zinke’s recommendations have not been made public, instead they were leaked by The Washington Post, so it remains unclear what happens next for the monuments on the list, four of which Zinke recommended be reduced in size. Trump is scheduled to be in Utah on Monday, where he is expected to announce a dramatic reduction in the size of the Bears Ears and Grand Staircase-Escalante National Monuments. Such a reduction would run counter to the thousands of public comments received by the Interior Department about the monuments. It is unclear when Trump will make announcements about other monuments on the review list. They should come quickly. Like the Katahdin region, the communities around the monuments in limbo deserve to know what the administration intends to do with these monuments so they can move forward. “The monument has created new demands and business opportunities in Millinocket, Medway and other communities near the monument. Properties that have been listed for years are starting to sell. Entrepreneurs are planning new businesses to serve the new visitors to our region. We’re talking increased property values and more jobs,” Dill wrote. Imagine what can happen if the artificial barriers thrown up by Trump and LePage are removed.